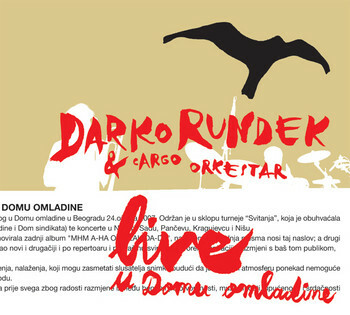 Live in Dom Omladine was recorded on the 23 March 2007 in Belgrade, during the Serbian leg of the promotional tour for the album MHM A-HA OH YEAH DA-DA. The concert was peppered with songs from various periods of Darko Rundek’s work, many of which the Belgrade audience new by heart. Brilliant atmosphere. Firstly, a confession: I’m not a fan of live albums. If the studio recordings are the artist’s definitive statement on how their material should sound, why do we need an invariably coarser and over-amplified live rendering, unless we are actually there witnessing the performance for real? So even though I’m a great admirer of Darko Rundek’s haunting, eclectic music, I approached this album with some trepidation. I felt sure it would just send me running back to the original recordings in search of their perfection. But then as each song slowly unravelled, my prejudices were delightfully confounded. Every track here demonstrates that for Darko the studio recording is just a beginning. And it’s immediately clear that the Cargo Orkestar are in their element - more uncaged than unplugged - as they turn each song inside-out and drag it across the stage wailing in protest. Isabel is simply a lead guitarist trapped in a violinist’s body. She unleashes torrents of mercurial notes which dive and swoop over the material, adding rococo detail one moment, and sustained cries of what might be either ecstasy or pain, the next. Then there’s pianist, Dusan Vranic, whose tumbling cascades of piano evoke memories of Mick Garson’s exemplary work for Bowie on ‘Aladdin Sane’. Also deserving a special mention is drummer, Djani Pervan whose loose, expressive playing sometimes seems to be the only thing preventing the music from disintegrating into chaos. But the band as a whole know just how near to the edge of the precipice to get. Structural order reasserts itself over improvisational chaos every time, and there is much pleasure to be derived from listening to this process take place. The final element that lifts this recording of a concert in a youth club in Belgrade to something out of the ordinary, is the audience. Maybe every audience that this charismatic Croatian performs in front of are this affectionate and vocal, I suspect that they are. But that doesn’t detract from the pleasure of hearing them joining in on almost every word and thus becoming an intrinsic part of the vaudevillian spirit of the whole event. This becomes most touching on the encore, ‘©al od svile (Scarf of Silk)’ This song is from Darko’s time with the 1980’s rock band, Haustor and it’s clearly a much loved favourite. The way the audience sing their hearts out almost convinces me that the song is a treasured part of my past too. So, what is it about this artist who is little known outside ex-Yugoslavia that they adore so much?Perhaps this question is best answered by posing some other questions. Can a musician simultaneously celebrate, make fun of, and mourn our very existence in this troubled world? Can a band evoke both the ragged, immutable spirit of New Orleans jazz and the woozy ambience of dub reggae in the same song? Does the brassy exuberance of Balkan Gypsy music belong with the romantic yearnings of chanson? The answer, to quote the last two words of ‘Mhm A-ha Oh Yeah Da-da’ is, ‘Da-da!’ Which of course translates as, ‘Yes-yes!’ Darko is undoubtedly aware that Dada is also the name of an early 20th Century aesthetic/political philosophy, which introduced the spirit of perverse wit and intellectual anarchy into art. So it’s interesting that both meanings of the word seem to equally apply to the semi-unhinged world of Darko Rundek and Cargo Orkestar. So in conclusion, this album made me fervently wish I’d been at this concert, while simultaneously making me grateful that I at least had this recording of it. So thanks, you lovely people, for reminding me of what the point of the live album is.